I love a good Kickstarter story... and this one is particularly inspiring. Dead broke and in need of a job after his wife had a child, Tyler Deeb borrowed $1200 from a friend to keep the bills paid. 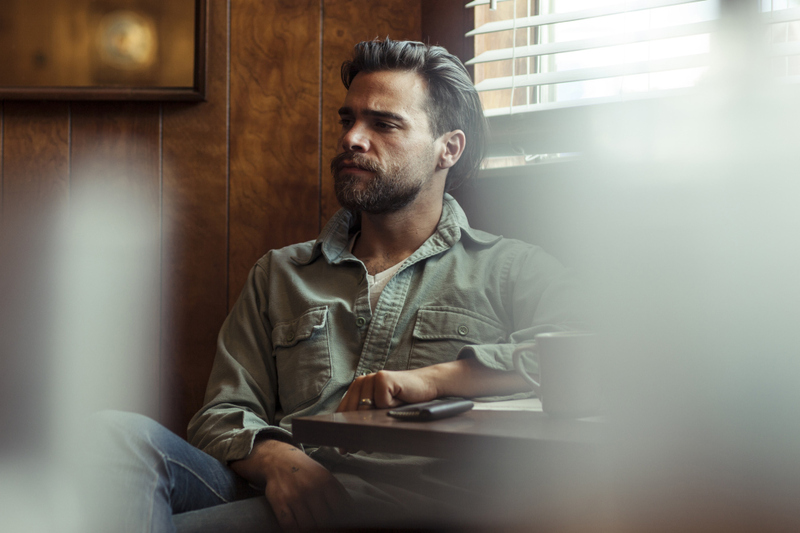 After playing with the idea of designing a deck of cards, he decided to give it a try and start a Kickstarter campaign. He was asking for $6250 to manufacture his cards. After just 20 days, he raised $146,596. His campaign went viral primarily because he was giving a face lift to something that sorely needed it and the design was incredibly cool. Quality was paramount and each set of cards are printed on Bee paper, which is the highest quality coated playing card stock. 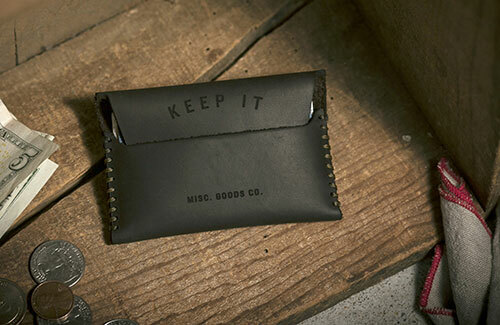 The handsome tuck case is printed with black ink, silver foil and is embossed. And I love the option to have a hard case, made by hand with cherry and walnut wood. The leather strap is tanned and the button is brass. I was lucky enough to hear from one of my favorite artist's recently, Karla Pruitt of Athens, Georgia. The last time I featured Karla on Sweet Peach, we shared her gorgeous wallpaper and art prints. So I was smiling ear to ear when I saw her latest creative endeavor...playing cards. 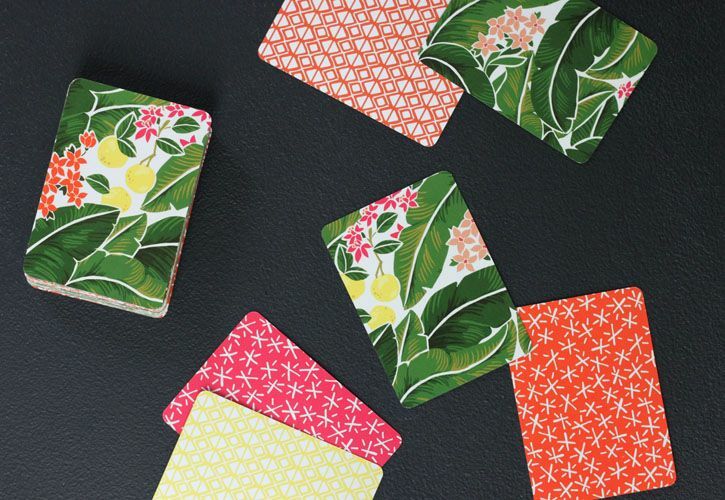 Karla designed her first card set from a few of her prior patterns for a beach trip but after receiving much fanfare, she realized the retail potential. Karla, "The biggest challenge was finding the time to draw out all the numbers and characters. It's almost like creating 52 little pieces of artwork." I love it when an artist finds their niche in the market place. 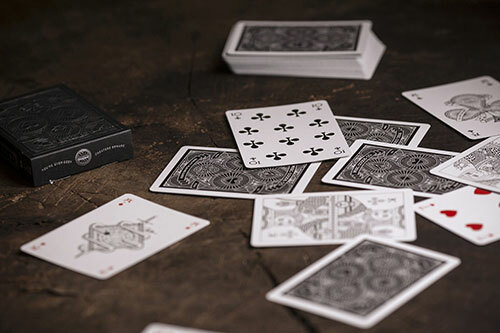 I've never had a set of beautifully designed playing cards and I can't wait to order some. 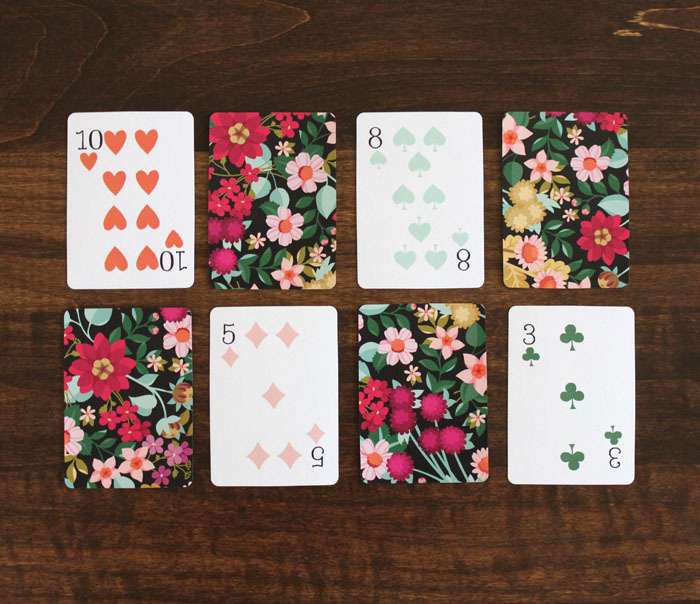 After a successful Kickstarter campaign, Karla raised enough money to design two different packs that incorporate original hand painted patterns and illustrations. 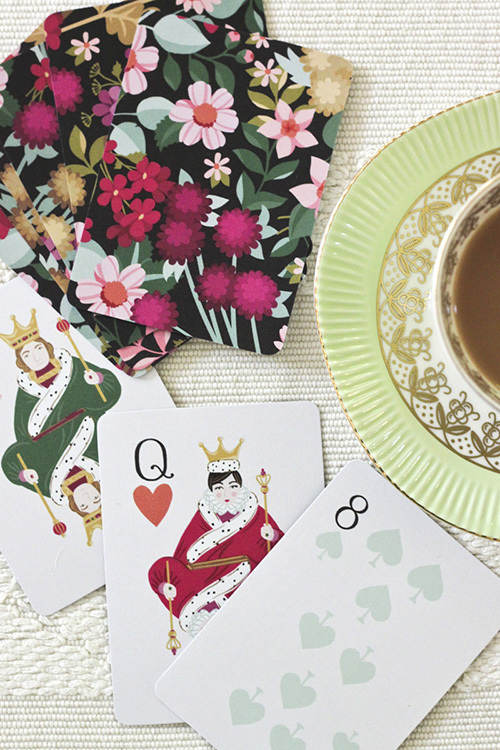 These Windsor Playing Cards showcase the loveliest floral pattern while featuring a regal queen, king, jack and some mischievous corgi joikers. Her second option is just as eye catching and fun. 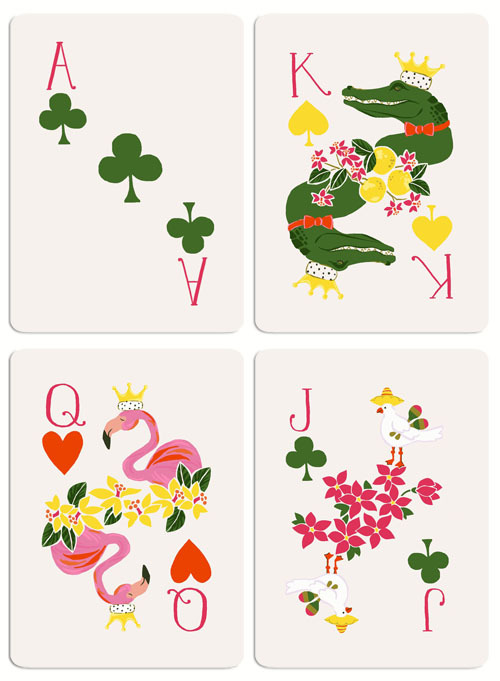 The Islet Playing Cards are comprised of queen flamingos, seagull jokers and king alligators. 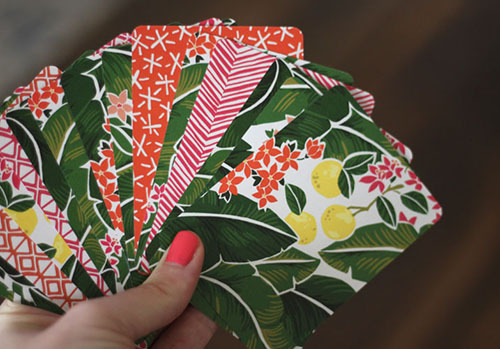 The remainder of cards show off more of Karla's illustrative skills as the back of the deck is covered in banana leaf prints and colorful geometric designs that happily remind me of my favorite vacation spot- anywhere tropical. I just can't love them enough. Karla's cards are so beautifully done and what an inspiration it is to have an idea, fund it on Kickstarter and then produce them for all the world to see. 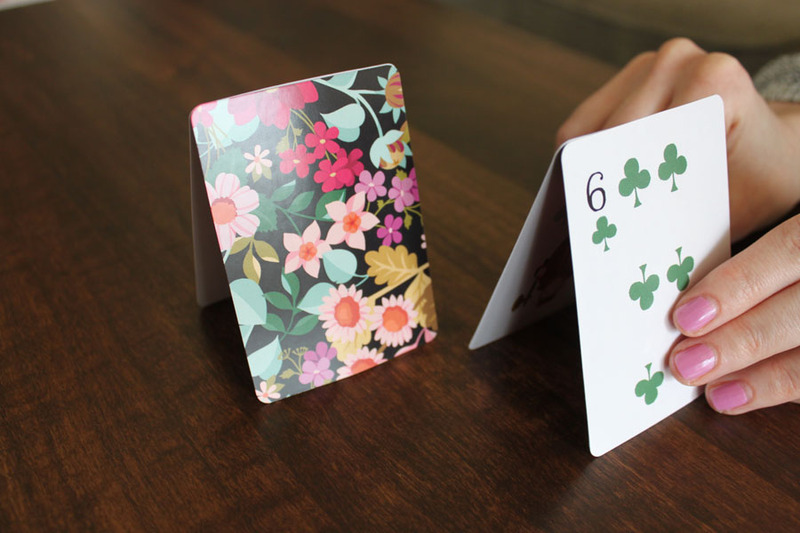 To add a pretty card pack to your purse or coffee table, just click here. And thank you so much for sharing with Sweet Peach Karla! It just makes me wonder... what's next?